We can't afford to go to Disney World and that bums me out. I love Disney movies and the characters and feeling happy and riding rides; and I've heard the parks are great about making kids with dietary issues feel not so left out of everything. But since I don't have the $20,000 needed to take my four kids there, I took a different kind of trip. 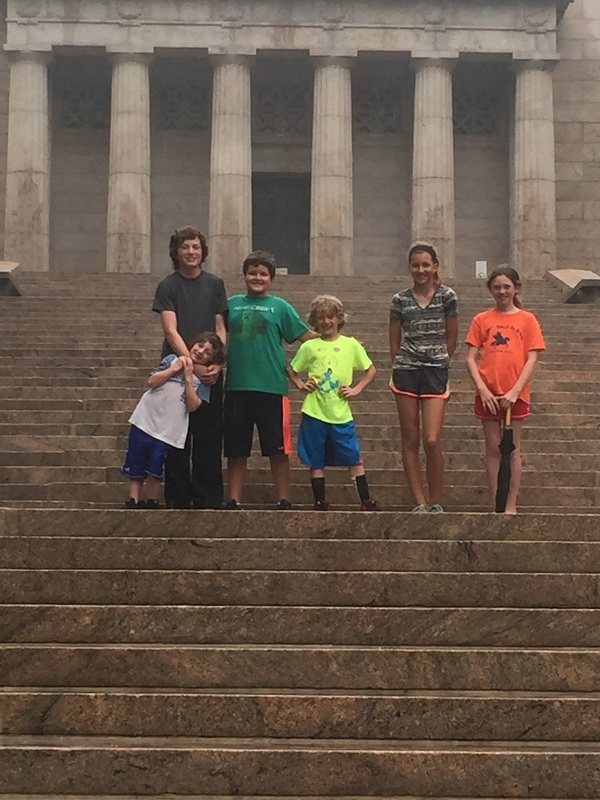 I took my kids on a road trip across parts of the southern United States during a very interesting couple weeks in our country. We saw family, visited museums, went to Graceland, celebrated history, got sad about history, celebrated Supreme Court news on the radio, got sad together as we listened to the President sing at a funeral on the radio, talked a lot, laughed a lot and ate a lot of peanut butter sandwiches on gluten free bread. It sure as hell wasn't a Disney version of anything, but we saw the world alright and if anyone asks me where to go on their next vacation I would tell them to grab your kids and get in the car and go. "When will we get there?," Wade asked me every 15 minutes during the first 327 miles of our trip. It was pretty normal stuff for a five-year-old kid. But when the other kids started asking me about what time we "had to be there" and if we would be late, I realized it was more than little kid curiosity. "You guys, we'll get there whenever we want," I said with a smile, my eyes on the wide open road. "Isn't that the best thing ever? It's our time, our pace." "Yeah, but what time is the thing that we are going to," Lucy asked. 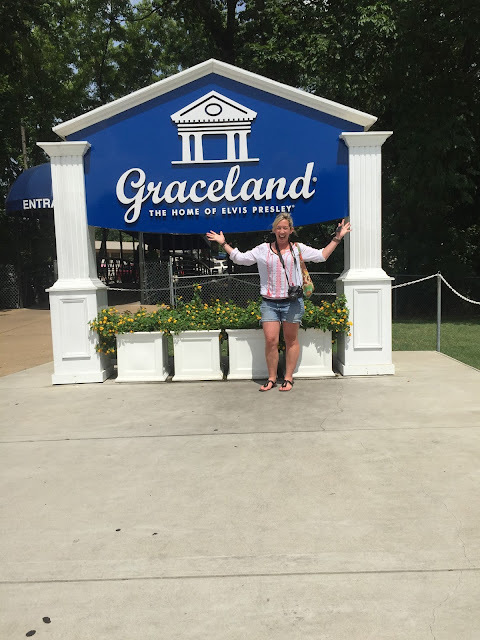 I tried to explain that we were going to a museum (Graceland) and stopping along the way and that we weren't in a hurry at all. I had to tell them that it was okay to stop anywhere and take our time. They all seemed uncomfortable with the whole concept of nothing to do. Maybe it's because all I do all day everyday is say "let's go! hurry up! we're going to be late. get a move on. practice starts soon. don't miss the bus. go to bed because you have to get up early. the movie is starting. church is starting. the game is starting. we're late! hurry! hurry! hurry!" My kids didn't know how to slow down and not have anywhere to be. 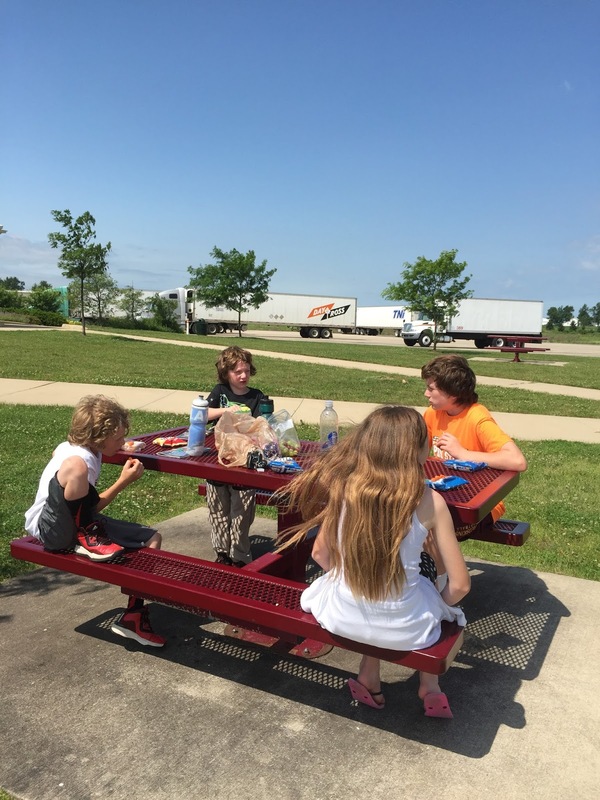 While I was feeling incredibly free from all of my anxiety and have-tos and like we had escaped and like I was really alive, my kids were feeling tense as hell. Around mile 500 and after I'd made them pose in front of several state signs and after a picnic at a rest area they finally started to ease into the idea of slowing down. They even started looking out the windows and noticing the sites and commenting on the farms and the sky and highway. Wade started waving to other cars and trucks on the road. It was startling at first to see drivers waving at me, but also kind of great. I've mentioned we are on a pretty tight budget, so there wasn't a lot of money for hotels. We are more of a motel kind of family. Frankly, we don't really care as long as they have a pool and a free continental breakfast. After about 12 hours on the road on the first day of our trip, we found the perfect motel in southern Illinois. The rooms were clean, the woman at the front desk was kind and there was a pool! The pool however wasn't all that great. It was murkier than most and my kids complained of their skin feeling like it was burning. I am usually the mom that considers the pool to be a substitute for her kids' baths in the summer, but I actually made them shower after this swim. The Continental breakfast bar was covered in ants. And the motel was full of really interesting people making questionable life choices. But no worries, we got a good night's sleep and were ready for the next day's adventures on the road and left with some good stories to tell, and possibly a slight rash. 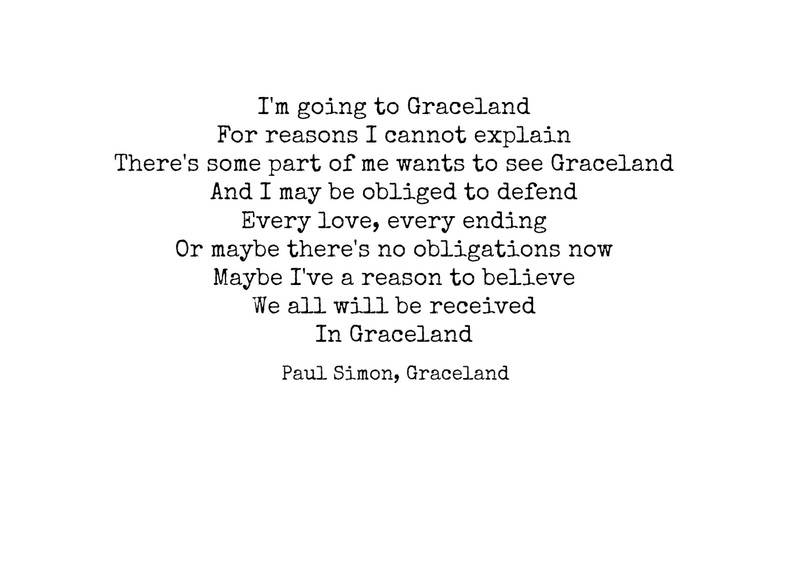 I missed a turn as we got closer to Graceland. The kids thought it was hilarious that I turned around in a place called Loretta's Liquor. 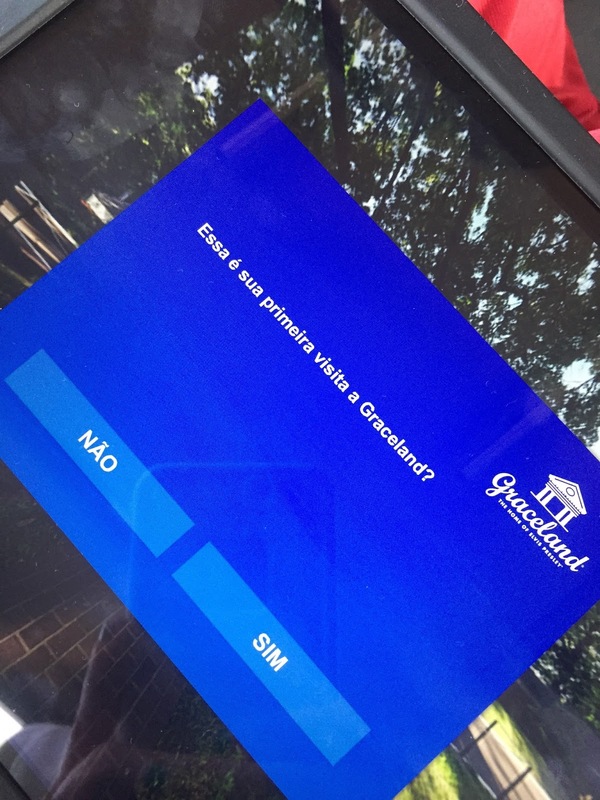 When we got to Graceland, the kids looked confused again. The parking lot was bustling with activity and people. The welcome center/ticket area was well organized and full of people. There were hipsters taking a music pilgrimage, there were people in their 70s who looked quite emotional, there were tour groups of women,and quite a few confused kids looking at my confused kids like "um, what are we doing here?" The house was fabulous. The tour was stellar. The ambiance and design was so 70s and fascinating. But the history was the best. I forgot or maybe never knew what a real artist Elvis really was and the HUGE impact he had on pop culture. A couple of my kids didn't get it, i.e. Wade's iPad tour guide was set to the Spanish setting which neither he nor I speak. But a couple of my kids really got into it, especially my oldest. I didn't want to leave, but after a quick trip to the gift stores we left. Once we got back in the minivan, I had no idea what to do next. "Now what?," I said out loud. 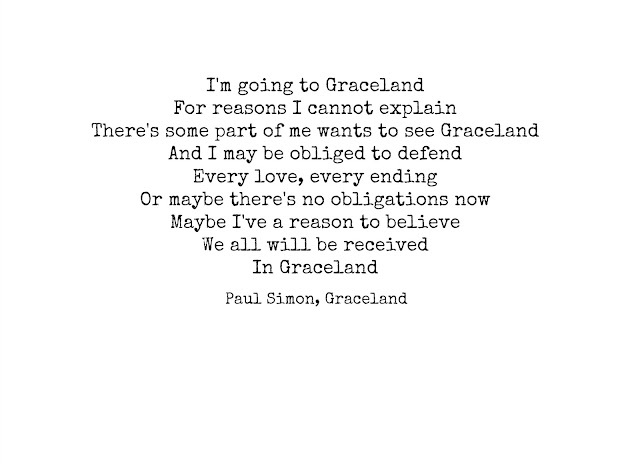 I had only really planned on getting to Graceland. I had NO IDEA what to do next....no hotel, no feel for the city, no plan. The whole thing made me laugh my head off. The kids weren't really phased at this point which I loved and considered progress in the whole project-get my kids to chill out adventure. 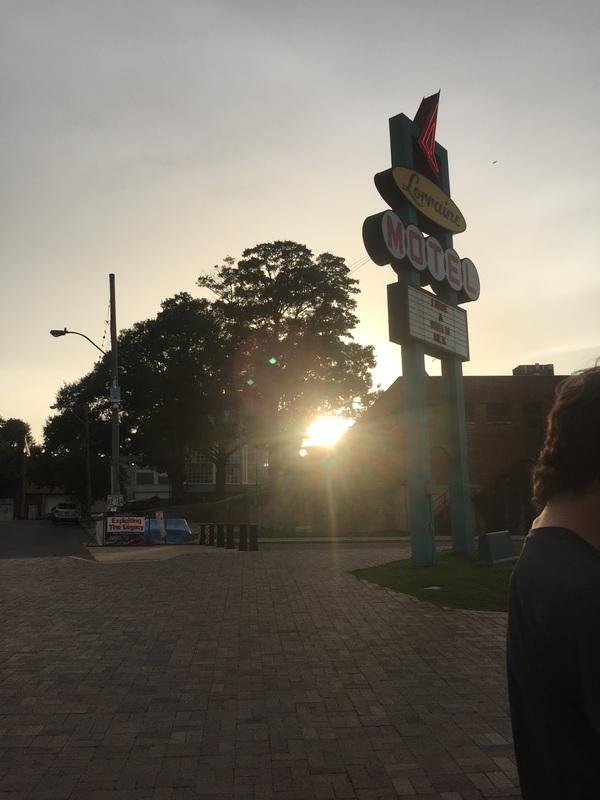 We ended up staying in Memphis for a night. I fell in love with the city. After passing on the first motel because of the bars on the windows, we stayed in a hotel with a pretty decent pool. After a quick swim, we got back in the minivan and headed into downtown Memphis. We visited the Civil Rights Museum. 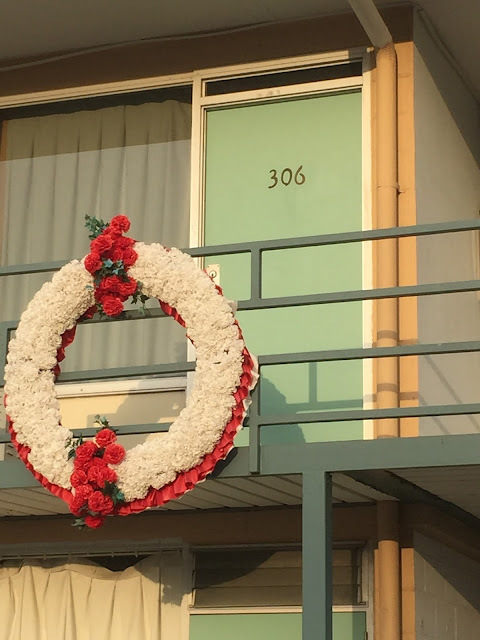 It was surreal, eerie, sad and inspiring. There was a protester across the street. My kids and I talked about Martin Luther King Jr. and civil rights and protesting and gentrification (what the protester's signs had on them) and talked about the shootings in Charleston and racism and progress and lack of progress and Detroit and how they feel about it all. The next day, we left for Alabama to visit my cousin which we do every summer. We took a wrong turn and ended up in Muscle Shoals, Alabama. Lucy saw a sign for Helen Keller's birth site and I said "let's go." My grandparents lived only about 40 minutes away from Helen Keller's home and my whole life I had wanted to visit the museum, so I thought that day was a good one to finally go see it. The tour guide sounded exactly like my grandmother. Our visit in Alabama and Kentucky was all family and cousins and past and present and future. My cousin and I have stayed close by visiting each other once a year for forever, talking on the phone once or twice a week on our commutes, and telling the stories of growing up together to our own children. It makes my heart burst with love when I see her son help my son or all of our kids play together. Lucy was the only girl here and I think she was handling it well. Here she is controlling the crazy game of trampoline dodge ball. At my sister's house, all of our kids slept in the basement in sleeping bags lined up on the floor. Just like we used to do with our cousins. They stayed up late laughing and talking and daring each other to do stupid stuff. This kind of connectedness and tradition is so important especially in an extended family that can feel so completely broken down by hurt feelings and divorce and rampant mental illness and sadness and complicatedness. There was also a baseball tournament and water park fun in Kentucky. And an amazing trip to a quirky country town in the hills of Kentucky that had more diversity than my suburb of Detroit. AND I could write a whole post about the awesomeness of the birth site and memorial of Abraham Lincoln (and maybe I will!). After 10 days and almost 2,000 miles and nine states, my kids and I saw a little corner of the world. It was full of good people and interesting people and all kinds of sites and sounds and views. It was full of harsh realities about our country and our world. It was full of beauty and kindness. It filled me with curiosity and passion and a desire to pay attention more to everything--the view, my life, other people's lives, my kids. One thing I didn't feel was fear. It's funny because at home I was suffering from some pretty intense anxiety and uncertainty about well, everything. Someone asked if I was afraid to travel with my kids alone and if I worried about what would happen if our van broke down or something went wrong. I told them I wasn't afraid and that I believed people would help me. I truly believe that. Hitting the road with no real plans, a minivan full of kids and a heart wide open helped me be less afraid. This road trip wasn't full of fairy tale endings, monorails, parades or fairy dust--it wasn't Disney World. Instead it was a real world adventure that connected my kids and me to pop icons, civil rights leaders, inspirational women and political leaders and cousins and family members and a region that has a complicated heritage and the idea of slowing down and listening and learning and paying attention making the most of wrong turns and hitting the open road and it connected us to each other. So yeah, we may never go to Disney World and it turns out, I'm okay with that. You are such a fun mom! I love that you did this! We are fans of the road trip too...only because of my OCD we book hotels ahead so we know where we need to get each day. Other than that, open road, baby! My husband and I road tripped to Montana for a wedding once. We went through North Dakota (and saw a giant cow statue) and came home through South Dakota (Wall Drug!). Good times. Oh and that tour language is totally not Spanish. Portuguese, maybe? You (maybe) make me want to attempt a road trip. Why are there no mentions of Rainbow Nerds? Rainbow Nerds are pretty much my road trip necessity. I am going to ask you a million questions about the whole thing. There's so much about the little hidden gems that I just love. We can't afford Disney either. I love these road trip posts. This is how I found your blog last year. I think the best trips are those where you have to drive, scrimp and make your fun along the way. This reminds me of the trips of my childhood and this is what I am doing for MY kids now and why I refuse to fly when we go anywhere. I think (no, I know) this was better than Disney for your children. That is was something they will be able to talk about and tell the stories of for the whole of their lives. I can't tell you how much I love reading your posts but I do. I love knowing there are people like you in the world, listening, talking, sharing, driving, loving and worrying. Oh my, this fills my heart. You make me want to do this with my kids next summer or even over Mardi Gras break in February! SO FUN! And you were SO close to me!! ACK! Glad you had a safe and fun time!